Ezio Auditore da Firenze is older, wiser, and most importantly, a man on a mission. From his inception as an assassin in Assassin's Creed II to his leadership over his comrades in Brotherhood, we've watched him grow from a reckless youth to a speckled gray-bearded veteran of the hidden blade. His journeys have brought him through many hardships that he frankly never asked for, but he has always unselfishly stepped up to the challenge. 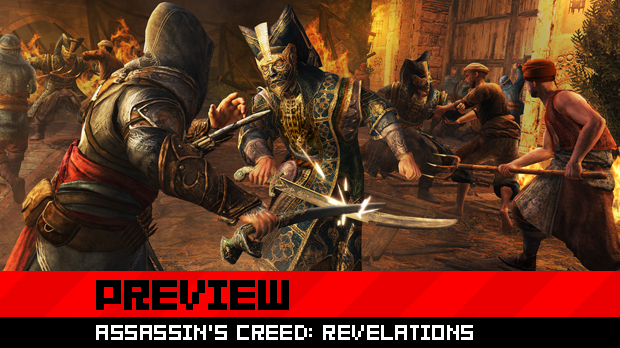 Assassin’s Creed: Revelations, the final chapter in the Ezio trilogy, sees the iconic Italian embark on a quest for clarity. 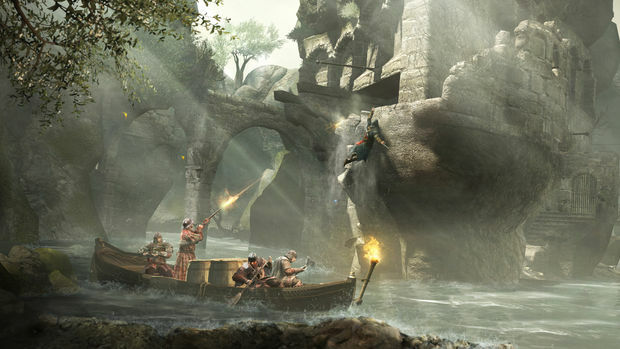 If you've seen the E3 cinematic then you know his journey begins in Masyaf, the home of AC 1 protagonist Altair. The mountain city, as well as the legendary first assassin, hold the key to Ezio's purpose in the grand scheme of this video game saga. Fast forward, past the beginning, past Masyaf, and that's where my hands-on time with the aged assassin begins. As Ezio sails into the crossroads of the world, Constantinople, he is greeted by another master of the trade, Yusuf Tazim. A rugged man, perhaps with a hint of Jesus Christ in his appearance, he is the leader of the local assassin's guild and your first ally in this foreign land. He looks up to the legend that Ezio has created, but at the same time he has a few tricks to teach the old dog for his impending adventure. After scurrying the city's Galata district a bit, dismissing a not so warm welcome, and obtaining some better armor, Yusuf is ready to give Ezio his guilds biggest advantage in the assassin game, the hookblade. Your training in the use of this new apparatus begins slowly, but its education is pivotal in understanding Ezio's advancement. It opens up the door for Ezio to be not just more dynamic in movement but also more graceful in combat. "Ezio has always been a very bulky character," explains Assassin's Creed: Revelations creative director Alexandre Amancio. "When he jumps down from a rooftop, you feel his weight. As he's getting older and becoming more powerful, we've added onto that weight and sort of that sluggishness of movement... we've continued evolving that, but to counter balance that, we've given him the hookblade. It's the advantage he's never had before. Even if he's a more massive and heavier character, the speed and grace that he has now comes from this new tool." From the first training mission Yusuf put me through all the way to my graduation with the new gadget, the evolution of this once cumbersome character is ever apparent. Ezio has always been this massive force that couldn't be stopped -- unless you ran into someone during a full sprint -- but never has he possessed the grace of Altair. With the hookblade, the old man actually moves 30% faster, thanks to its ability to quickly hurdle enemies, scale buildings rapidly, and travel across the rooftops' friendly zip lines. Soaring quickly across Constantinople is a spectacular ride, as the city is rich with activity and detail. The Assassin's Creed series has always been about its beautiful, expansive vistas, and Revelations is no different. This isn't just a quick cash-in with last year's game engine -- the graphics have, yet again, been overhauled to induce an even more immersing experience. Revamped shaders, volumetric 3D smoke effects, and a new 24-hour cycle bring the city to a level of unparalleled realism, but it doesn't end there. Unlike in Brotherhood, Ezio will not just be confined to one locale. "We liked the big city of Brotherhood, but we also liked the epic feeling of Assassin's Creed II because of its many locations," Amancio continues. "It almost felt larger than life, like you were on this epic quest. We have the huge city of Constantinople, which is actually a little bit smaller than Rome in terms of size, but Rome was about 45 percent empty space. Constantinople, in terms of urban area, is bigger. There are more buildings, more layers, more heights." More buildings with more layers leads to a more dangerous experiences for Ezio. 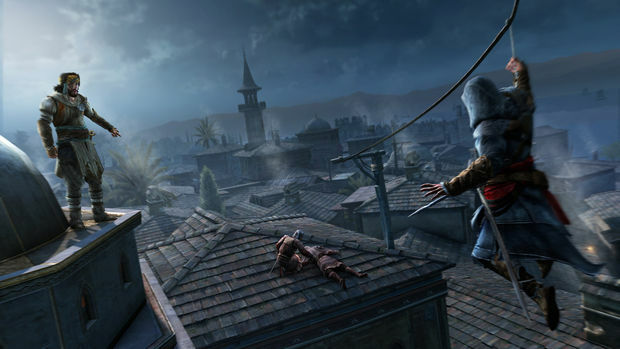 Constantinople is a city teetering on the balance between the assassins and Templars. As I wrap up my tutelage with Yusuf, I am introduced to Den Defense, one of the game's dynamic new ventures that sits around this Templar conflict. At its core, Den Defense is a tower defense mini-game. By successfully defeating waves of Templars, morale is built which is then used for further fortification. Archers, rifleman, and barricades are just some of the tactical elements for strategy in the beginning, but successful completion of defenses will eventually unlock new units, like air assassins. Defending your base of operation is an important new gameplay element that is just as much intertwined into the story as it is key for strengthening your newfound brotherhood. 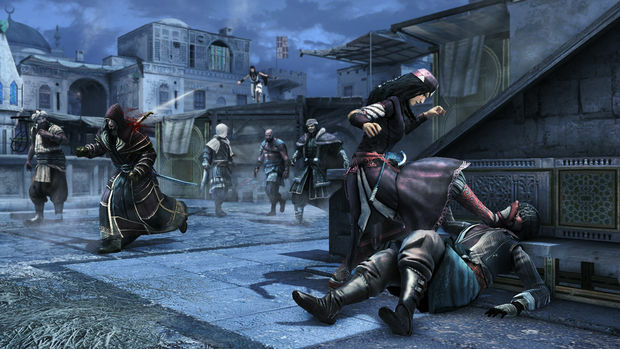 Taking over dens -- like the Borgia towers from Brotherhood -- builds new safe havens for Ezio to transfer around the city. Unlike the Borgia towers, dens, once taken over, can be contested at any time by the Templars, creating a sort of chess match in the city. "The reason we came up with the gameplay was first and foremost character driven," says Amancio. "Ezio is older, more powerful, a mentor, a general. Why not have him on the rooftops commanding his men and fight off this onslaught of Templars?" This constant struggle later in the game could prove distracting to the main narrative, but like so many other aspects of Brotherhood, the assassin recruiting has seen a major face-lift in design. Previously, building recruits ended at level 10, with them becoming full fledged assassins. That has now been increased to level 15, with them becoming master assassins who can be assigned as a master of a den, preventing it from further attacks. "We really wanted to create characters that have flesh and blood, less systemic characters, less generic characters," explains Amancio. "So once you reach level 10, these assassins approach you with a personal quest. They will ask for their mentor's help, and you, Ezio, can cooperate with these assassins on these missions. It's sort of a co-op mission with your own pupil." Everything from top to bottom in Revelations feels more fleshed out. From the side quests to the main narrative, this by far the most cinematic experience in the series. In Ezio's journey to understand his connection to Altair, he explores some truly breathtaking catacombs that rival the Uncharted series in their cinematic excitement. I don't want to spoil anything, but the road to and the actual Altair sequences themselves -- at least the ones I played -- were by far the most memorable and exciting moments I had ever played in an Assassin's Creed game. In case you were worried, Desmond's not forgotten either. "We do have bits of sequences with Desmond," promises Amancio. "They're really a new approach for the character. He is not in the physical world, but he does have an ally that is guiding him. These are mostly narrative sequences, and their goal is to give more depth into the character, which until this point has been a very two-dimensional character. 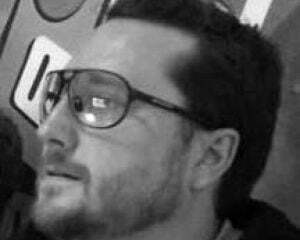 There is quite a considerable Desmond experience in the game if you chose to delve in to it." Currently, Assassin's Creed Revelations is set to offer around the same gameplay length as Brotherhood with a longer main quest and less, more focused side missions. As Maurice stated in his preview in August, the final moments of Revelations should be even more dramatic than Brotherhood's cliff hanger ending. Throw in, hopefully, another great multiplayer mode on top everything this game is already packing, and I don't know about you, but that has me pretty excited.